Firstly, we'd like to thank everyone for their feedback on WhoseBill - it really helps us understand what's good and bad, and push things forward in the right direction. 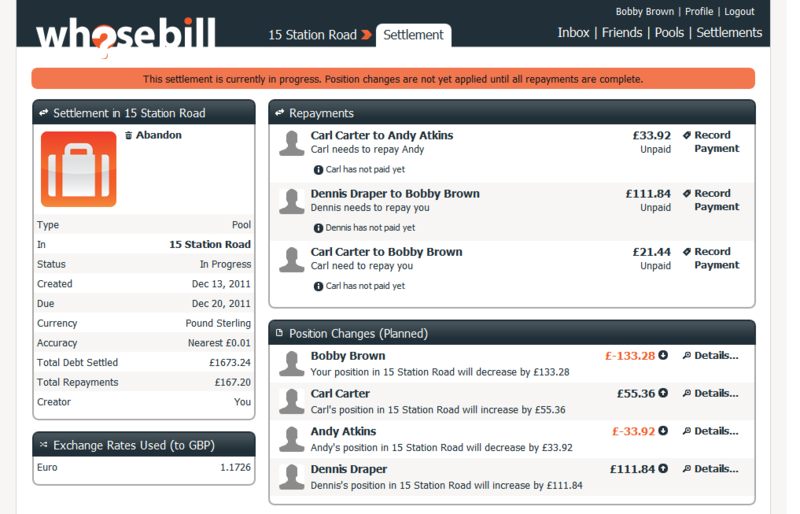 We've introduced a new type of bill to WhoseBill called a Repayment. Repayments are very similar to Loans, but let you record the payment or receipt of money with friends, to pay off prior debts. Repayments essentially cancel debts caused by Joint Bills and Loans, so you'll see them subtracted from the amounts owed in our new position summaries (see below). Settlements automatically generated a set of Repayments to settle all the outstanding debts, either between you and a friend, or in an entire pool. We are also thinking about how to introduce other types of Settlement in the future for other common situations. Under the hood, Settlements are actually a little clever than Repayments, as they cancel all the relevant debts in all currencies, but generate the simplest equivalent set of Repayments (see below for more on Settlements). The addition of Repayments, has involved a slight change to how you enter a bill, as there are now a few more options to choose from. 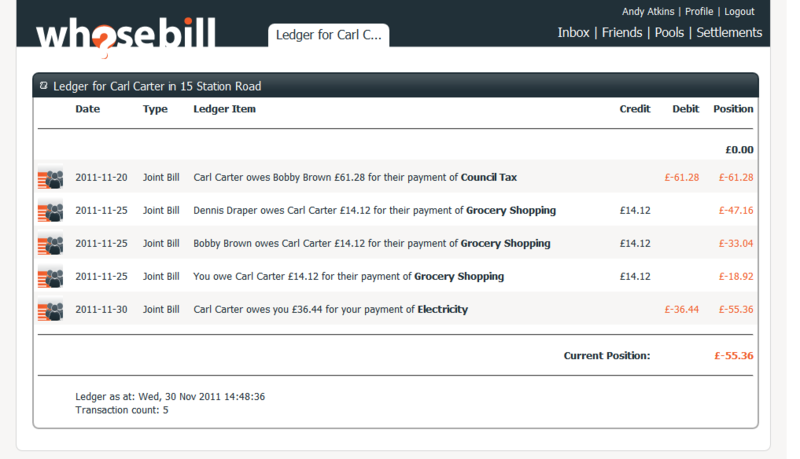 We've added a quick selector to choose the type of bill you want to add from any "Record Bill" link on the site. 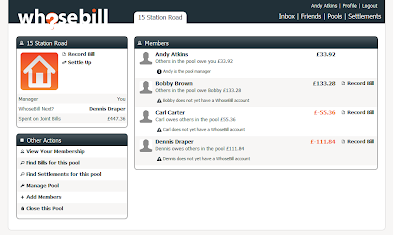 These links are context- sensitive, so for example if you were to add a Joint Bill from one of your pools, it will include all the active members of that pool as a default. 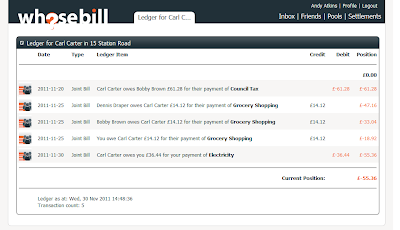 You'll also notice some tweaks to the information we display for bills in your inbox and elsewhere on the site, to try and bring the most relevant information to you. 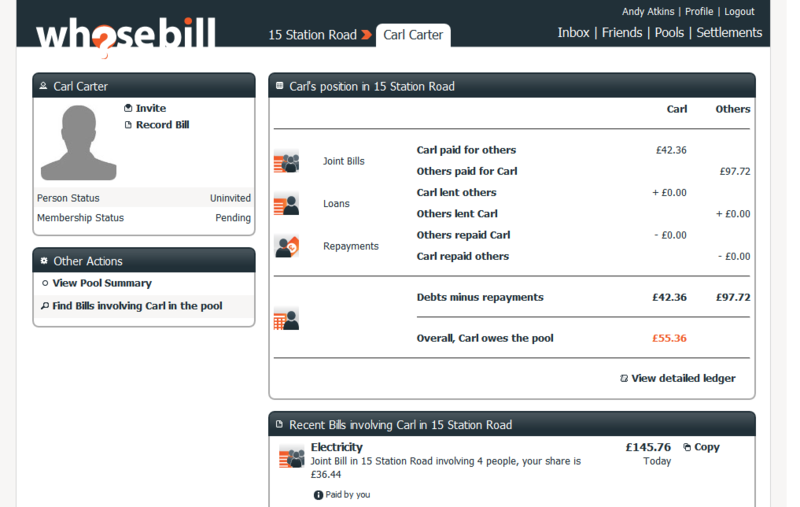 This also includes a hotly-requested tweak to include the date of the bill so you can find them more easily. Finally, we've upgraded the search tools for bills (accessible from the "Search Bills" link in your inbox) to allow for more poweful searching. You may also notice a few more links around the site to take you directly to common searches; for example, "find all the joint bills that I'm involved in my household pool, but which someone else paid for." 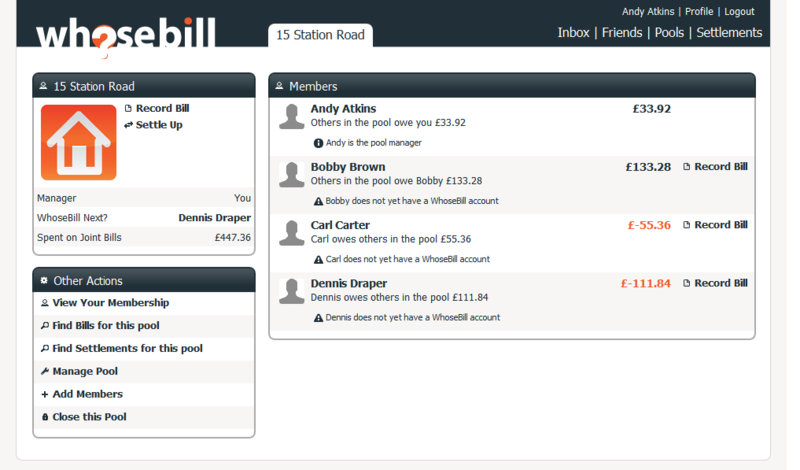 We've also made some changes to the way we show your position with friends and in your pools. The position summary has been moved into prime position when looking at a friend page or your membership to a pool. It now includes a full breakdown of the debts for Joint Bills and Loans, and how any Repayments (or Settlements) have reduced those debts. If you want to see the full breakdown of how your current position is calculated, you can click on the "View detailed ledger" link which will show you a full list of every transaction that contributes to your current position. This can really be useful for showing others why they owe you money and getting them to pay up! As a final tweak to the friend and membership pages, we've included a short list of recent bills, so you can see at a glance the last few things that have happened. 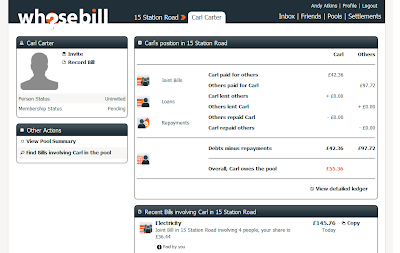 There's also a quick link to find all the relevant bills, organised by timeline. We've also made some changes to Settlements, which we hope make it a bit easier to understand what's going on behind the scenes. When creating or reviewing a Settlement, you will still see the required Repayments and the overall position changes for each person involved below. However, we've tweaked the language a little to make things clearer, and now only show amounts in the chosen Repayment currency. 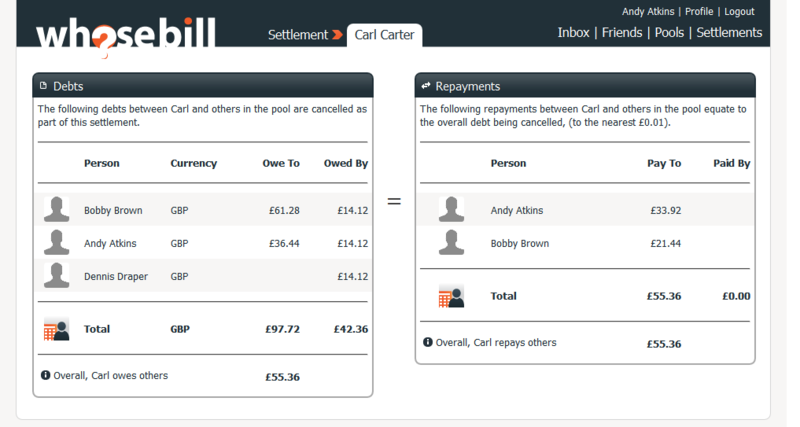 We've also added a new screen, which lets you reconcile how the position changes equate to the repayments for each person. Simply click on the "Details..." link next to each person, and you will get a breakdown of how their overall debts match up with their repayments. This also shows you how debts in other currencies have been converted to the repayment currency. Last but not least, we've added a bit more information to the pool summary page, which shows you how much has been spent in total on Joint Bills. This gives you a quick way to see how much you've spent so far, and can be especially useful if you want to look back to find out how much the holiday you just went on really cost you! We're always working on new features and will be bringing more improvements in the future. 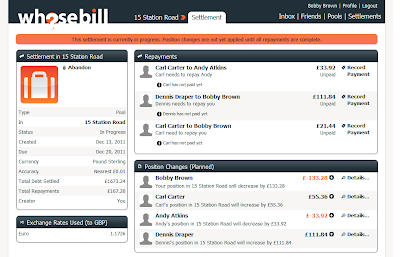 If you have any ideas or feedback on WhoseBill we'd love to hear from you - just email us at support@whosebill.com.